A leading provider of fixed-line broadband, voice telephony, television, and mobile services to consumers and businesses in the United Kingdom had a customer communications challenge. The company historically had managed its customer billing processes through an outsourced printing and fulfillment partner that handled production and delivery of paper-based billing statements. However, as the company and its customers moved towards digital communications channels, this arrangement became increasingly inefficient and an obstacle to customer responsiveness. Paper statements were expensive to produce and deliver, and didn’t provide the kind of auditability and delivery vericication the business required to ensure its customers were receiving proper billing notification. In discussion with Exstream, the premier customer communications management (CCM) platform, company executives determined that bringing statement production and digital delivery in-house would drive business efficiency through consolidated and streamlined operations, including eliminating the considerable recurring costs of consuming third-party production services. Moreover, unifying digital communications in-house would provide greater convenience and responsiveness to customers. 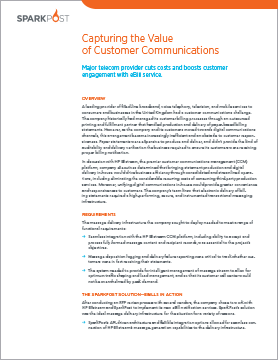 The company’s team knew that electronic delivery of billing statements required a high-performing, secure, and instrumented transactional messaging infrastructure.